The OSHA 10 course provides training for workers and employers on the recognition, avoidance, abatement, and prevention of safety and health hazards in workplaces. It is specifically designed for individuals in a supervisory position and is part of the OSHA outreach program resulting in a 10-hour OSHA Construction Certification Card. This course has 10 contact hours. This is a lecture-lab course, though the majority of time is spent in the classroom. Lecture topics are presented in the classroom setting followed by group discussion and analysis of safety scenarios. Some hands-on demonstrations and practice will take place in the lab. The class is appropriate for students who have previous training and experience in this field. Student participation in discussions in the classroom and in the lab exercises is very important. This course has a written final exam and student participation is graded as pass/fail. The final exam is a written test and each student must pass with a 70% score or higher. 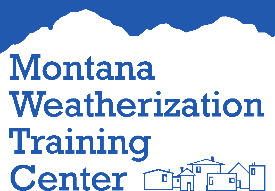 Students that do not pass will be allowed to retake the exam in accordance with the Montana Weatherization Training Center retesting policy. Students must attend all 10 hours of lecture for certification.